If a business book has a single insight that makes me think differently about the world, it is a success. This book does that. I was reminded that in many arguments we don't have disagreements at all – we aren't even having the same conversation. Instead, one person is talking about the strengths of his own position and the weaknesses of it's polar opposite, while his opponent is arguing the strengths of her position, and the weaknesses of ITS opposite. It is possible – indeed, probable –that they are both absolutely right. For years I've known that we live in a "both/and" world. 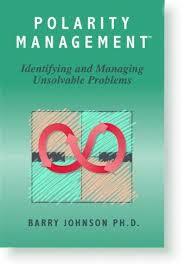 This book simply gave me a better framework to see a problem from all sides. The author taught me work at acknowledging the correctness of both polarities and work to gain the benefits of each and mitigate the risks of each – because both are very real. I'll admit this book is a bit of a slog. BUT, his insight is genuine and I found well worth the effort.